A line in our upcoming show has stood out to me each time I’ve heard it in rehearsal. In Something Intangible, Sonia, the doctor, says she finds “comfort in the ritual” of going to the theatre. I’ve thought about that line all week. More than likely, my ritual of “going to the theatre” is different than yours. It’s my job, after all. I get up in the morning, walk my dog, make a cup of tea, get ready, and drive to 8th Avenue. I park across the street and stroll in the beautiful Florida sunshine toward the building. When I open the door, I’m greeted by a member of the staff at the Norris Center and then I head to the office for a full day’s work. Rinse and repeat. My guess is that your theatre ritual is different. Perhaps in the evening, you freshen up, have a costume change, enjoy a lovely dinner with friends and/or family, enter the theatre and collect your tickets, spend a few minutes roaming the lobby with a glass of wine and then take your seats for a theatrical experience. Lights, Costumes, Sound, and a fantastic story. 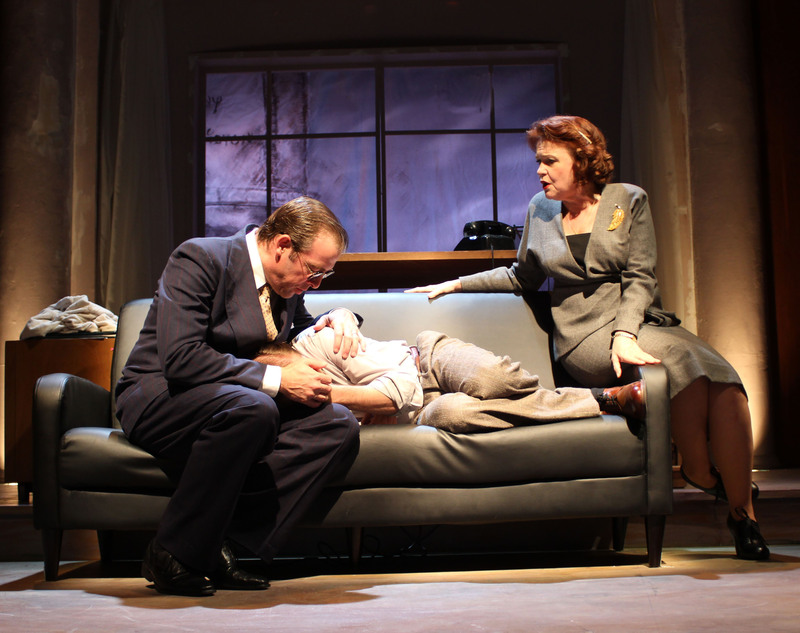 Ian Merrill Peakes, Shawn Fagan, and Charlotte Booker in Gulfshore Playhouse’s production of “Something Intangible”. Some days I get to experience a version of your ritual: Opening nights. They’re a bit rushed for us, I won’t lie, but it is so exciting to see the rehearsal process come to fruition on Opening. Adding the audience is the final step in the process. There’s a hum in the air. There is an energy in the staff and patrons. And there is an undeniable sense of joy and pride in the hard work and discovery that’s paid off. We open Something Intangible directed by Cody Nickell on Friday, and previews begin tonight. I really can’t wait! I go through my theatre ritual everyday, but there is something about opening week that reminds me why I enjoy this work so much and why I cannot imagine myself going through any other ritual each day.